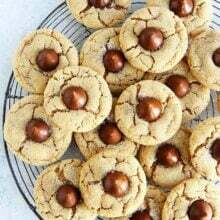 Peanut Butter Blossoms-soft peanut butter cookies topped with a chocolate kiss candy in the center. These easy peanut butter cookies are a holiday favorite! What are your go to Christmas cookies? I want to know because I am always looking for new cookie recipes to try. BUT I do have my classics that I HAVE to make every year or it just isn’t Christmas. Peanut Butter Blossoms are one of those cookies that I make every single Christmas. They are a tradition and it isn’t Christmas until I eat at least a half dozen. If you haven’t had a peanut butter blossom, let me introduce you. 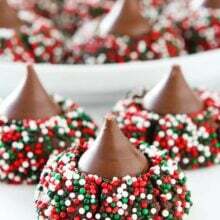 They are soft peanut butter cookies coated in sugar and topped with a chocolate kiss candy. Yep, cookie perfection! And a little history lesson for you because I found this interesting:) This perfect peanut butter cookie was created by Mrs. Freda F. Smith for the ninth Pillsbury Bake-Off competition. Mrs. Smith’s recipe was a finalist, but failed to win the grand prize. And fun fact, she originally named her cookies Black-Eyed Susans, but Pillsbury changed the name to Peanut Blossoms. In 1999, Peanut Blossoms received their overdue recognition and were entered into the Pillsbury Bake-Off Hall of Fame, honoring the contest’s most popular recipes. Peanut butter blossoms are easy to make and I am going to share a few tips to make sure you get them perfect every single time! Start with the peanut butter cookie dough. All of the ingredients are basic cookie ingredients. Make sure you use creamy peanut butter and not natural peanut butter. Go with regular old peanut butter for this recipe… JIF, Skippy, or your favorite brand. Make sure your butter is at room temperature and not too soft or melted. You don’t want the cookies to spread. When you touch the stick of butter it should leave a slight indent, but it should not be super soft or mushy. I use my stand mixer to make sure the butter, peanut butter, and sugars get nice and creamy. You can use a hand mixer or mix by hand, but make sure you really mix the ingredients together until they are smooth. This recipe has a little milk in it to keep the dough soft and moist. I use whole milk, but any milk will work. After you add the dry ingredients, don’t over mix the dough. Beat on low just until the flour disappears. You do need to chill the peanut butter dough for at least 30 minutes before baking. You can chill the dough for up to 72 hours. While the dough is chilling, unwrap the chocolate kisses and put them in the freezer. This will prevent the kisses from melting when you put them onto the cookies. This is an important step! When you are ready to bake, roll the cookie dough into small balls, about 1 tablespoon of dough per cookie. Roll the cookies into the remaining sugar until the cookies are well coated. Place the cookie dough balls onto a baking sheet that has been lined with a Silpat or parchment paper, leaving about 2-inches between each cookie. Bake the cookies for 8 or 9 minutes. Remove the baking sheet from the oven and quickly press a frozen chocolate kiss in the center of each cookie. Press until the cookie crackles. Place the baking sheet back in the oven and bake for an additional 2 minutes. Don’t leave the cookies in the oven for longer or the kisses will start to melt. Don’t over bake the cookies, you want them to stay nice and soft. They will set up as they cool! Remove the cookies from the oven and let them cool on the baking sheet for 2 to 3 minutes or until they are set up enough to transfer to a wire cooling rack. Let the cookies cool completely, until the chocolate kiss is hard. To speed up the process, you can put the cookies in the refrigerator or freezer. Store the cookies in an airtight container for up to 4 days. Can You Freeze Peanut Butter Blossoms? Yes! To freeze peanut butter blossoms make sure they are completely cooled and the kisses are hard. Place the cookies in a single layer in an airtight container. If you need to make two layers, place a piece of parchment paper or wax paper on top of the bottom layer. Add another layer of cookies. Seal and freeze the cookies for up to two months. You can also freeze the cookies in a freezer bag, just make sure you don’t set anything on top of the cookies in the freezer. You don’t want to smash the kisses. Peanut Butter Blossoms are a traditional Christmas cookie and always make an appearance at cookie exchanges, parties, and on Santa’s plate. 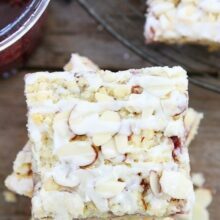 I like to add them to our neighbor cookie plates and they are always a hit! Our friends look forward to them every year! 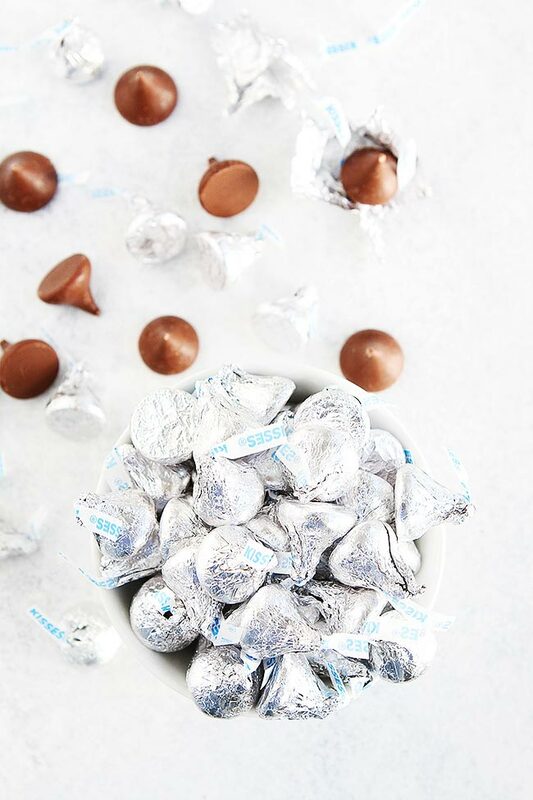 And if you want to mix things up, you can use different Hershey’s kisses…dark chocolate, caramel, almond, or even Hugs. Make Peanut Butter Blossoms part of your Christmas traditions. They are guaranteed to be a family favorite! Looking for more Christmas cookies? You are in luck because I teamed up with Tessa to bring you a FREE Christmas Cookie Guide! Download it NOW and get baking! 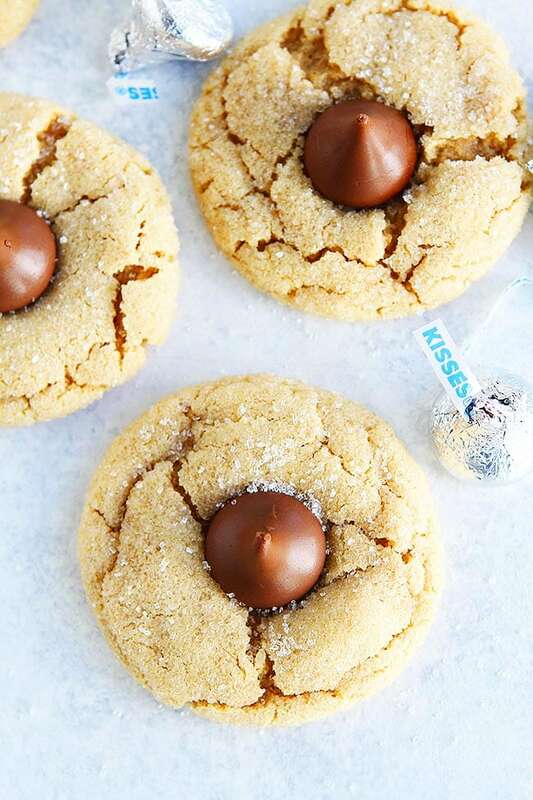 Soft peanut butter cookies with a chocolate kiss in the center. 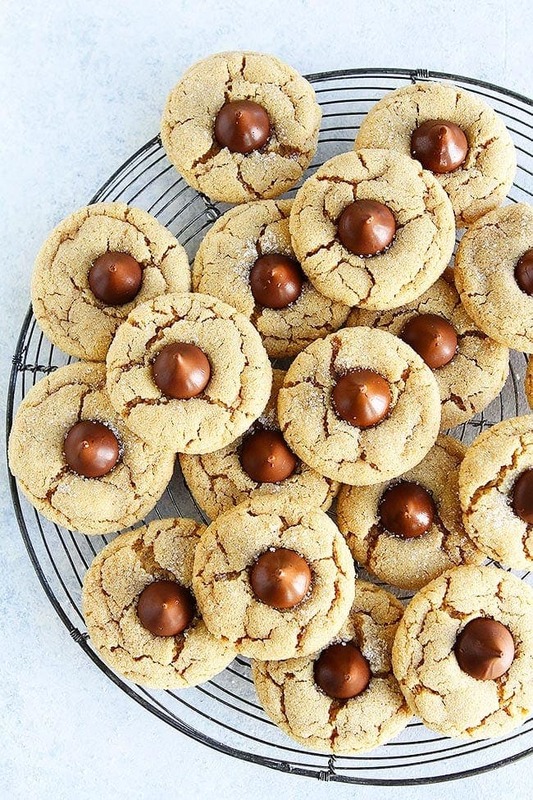 Everyone LOVES these peanut butter cookies! 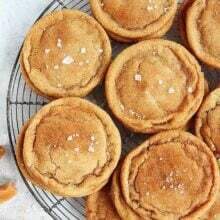 Using a stand mixer or hand mixer, cream together butter, peanut butter, 1/2 cup granulated sugar, and brown sugar until smooth, scraping down the side of the bowl if necessary. Add the egg, milk and vanilla extract. Beat until combined. Add the flour mixture and mix on low until just combined. Don't over mix. Wrap the dough in plastic wrap and chill in the refrigerator for at least 30 minutes. Can be chilled for up to 72 hours. 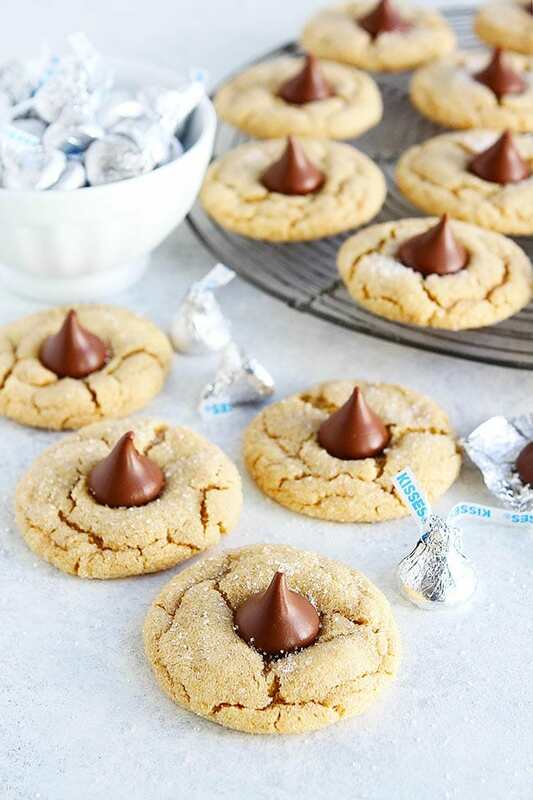 Place the Hershey's Kisses in the freezer so they are frozen when you put them on the cookies. This will help the kisses to keep their shape and not melt. When ready to bake, preheat oven to 350 degrees F. Line a large baking sheet with a Silpat baking mat or parchment paper. Roll the peanut butter cookie dough into balls, about 1 tablespoon of dough per cookie. Place the remaining 1/2 cup sugar in a small bowl. Roll the cookie dough balls in the sugar until they are generously coated. Place the cookie dough balls onto the prepare baking sheet, about 2-inches apart. Bake the cookies until they start to crack on the edges, about 8 or 9 minutes. Remove the baking sheet from oven and lightly press a frozen chocolate kiss into the center of each cookie, allowing it to crack slightly. Return to oven and bake for an additional 2 minutes. Remove from the oven and let the cookies cool on the baking sheet for 2 to 3 minutes. Transfer to a cooling rack and cool until the kisses harden. If you want to speed up the process, you can put the cookies in the freezer so the kisses will harden faster. Love these iconic holiday cookies! Any thoughts on cooking these or other cookies at altitude? I live in Salt Lake City and they turn out great! Why do you freeze the kiss, put it on and then bake again? My mom would bake them and then out the kiss on when they came out . Incredible recipe! The cookies turned out really moist. Guaranteed will be making these again! This has been a Christmas tradition for my husbands family since he was a teenager. However, he always tosses the kiss and eats the peanut butter cookie. I have never thought these cookies were so great, so last year I decided to replace the hershey kiss with a small reeses peanut butter cup. We both liked them so much better this way. So play around with the recipe to your preference!